designed around the way one�s body works. 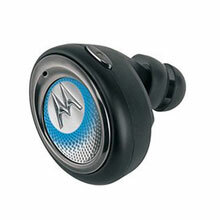 Equipped with a microphone and an in-ear speaker, it picks up the voice of the user through its ear canal. The MINI H5 is designed in a manner, to reduce surrounding noise and enable clear communication in crowded and noisy environment. Measuring at a mere 33 x 41mm, it is small enough, with a flanged ear tip to guarantee a comfortable in-ear fit. The good thing about this headset is its built-in microphone and speaker which routes voices through the user�s ear canal, avoiding unnecessary screaming and howling of individuals, in order to get a message through. In addition, the MINI H5 does not feature a booming microphone, unlike other headsets. This revolutionary headset, bids goodbye to bulky device�s that had to be wrapped around the ears, with its wires dangling below. The MINI H5 headset packs in a battery so powerful, that the user can talk wire free for up to 7.5 hours using the included portable charging base. It is perhaps the smallest Bluetooth headset available today; it comes with a black, stylish portable charging base. The MINI H5 works with most Bluetooth enabled cell phones, and accommodates a range of up to 30 feet.